Economists often refer to Brazil, Russia, India and China (BRIC) as potential “locomotives” of world development. British financial analyst Anatole Kalecki considers that a steady development of the world economy depends on the vitality of large and larger nations — China and India, also Brazil, Russia, Indonesia, Egypt, South Africa, etc. This vitality will ultimately be determined by the ability of the ruling circles in the world community’s “new influentials” to effectively expand and increase the capacity of their domestic markets, stimulate solvent demand on the part of the population and turn the middle class into the driving force of social development. Brazil, Russia, India and China, while working together, are at the same time guided by principles of “sensible egoism”. Sensing daily the inability of the “traditional” centers of the world economy (the US, Western Europe and Japan) to cope with the growing swell of global problems (financial, industrial, security, ecology, climate, etc. 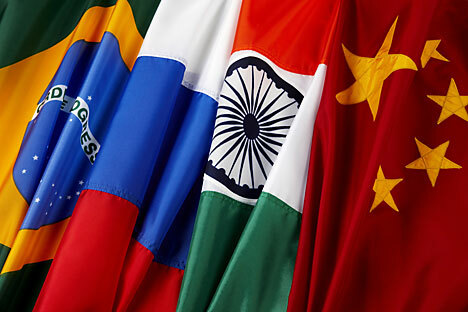 ), the BRIC nations are striving to create a space that is relatively free of the “turbulence” of global economic processes. Given these aims, it is logical that member-nations would want to progressively expand BRIC’s economic space. History does not stand still: it is a “living, developing process”, as the German statesman Willy Brandt wrote more than two decades ago. The attractiveness of BRIC nations lies, evidently, not just in the possibility of creating one of the most capacious “domestic” markets in the world. According to the International Monetary Fund, BRIC’s economic space will account for 61% of world economic growth in 2014. Not surprisingly South Africa had to wait several years before receiving a formal invitation to join BRIC towards the end of 2010. At first glance, the South African economy, which is only a quarter of Russia and India’s GDP, does not look like a viable partner for BRIC. However, Brazil, Russia, India and China took a long-range strategic view. First of all, the depressed development of economies in the West and Japan continues, while their regenerative growth in the wake of the global financial crisis refuses to turn into an energetic development stimulating the world economy. Under the circumstances, a “free geometry” of international economic relations will help both in the search for new “points” and spaces of growth, and in the modernization of national-economic complexes in the process of multilateral cooperation. It will also help lower the financial risks by diversifying the “pool” of world reserve currencies. Secondly, South Africa’s accession to the BRIC space reflects already existing foreign economic ties between it and China (the PRC is South Africa’s largest trading partner), as well as its close cooperation with Brazil and India, ties which have been developing on a solid intergovernmental footing for more than a decade. Russia will have to quickly rid itself of its distasteful status as an outsider in this strategically important field. Thirdly, South Africa has the most developed and diversified economy on the African continent. It is a sort of “beachhead” for expanding BRIC’s economic engagement with the continent whose potential for development has not yet been properly assessed. In its turn, South Africa is entirely aware that its joining BRIC may act as a powerful multiplier of its growth and development, as was the case with Australia, thanks to its close economic cooperation with China. Moreover, the BRIC countries have evidently not forgotten the fact that at least 90% of portfolio investments enter the economies of African states through financial institutions in Johannesburg. Fourthly, South Africa’s admission to BRIC may be just the bright beginning of a new process which will soon involve such “new regional leaders” as Indonesia, Iran, Turkey, Egypt, Argentina, Venezuela, etc. The leaders of these countries know that the regenerative growth of the world economy in and of itself does not turn into its ascendant and energetic growth. It’s clear that conscious effort will be required, and this effort will have to be made outside the space of the “traditional” leaders of the world economy. If this logic is translated into specific actions, then we may well become witnesses to the formation of a new “fourth world project”, to borrow the terminology of Egyptian economist Samir Amin. As you may recall, the three previous projects — “the state of general prosperity” (developed capitalist countries), “the Bandung project” (developing countries) and “capitalism without capitalists” (the world of socialism) — determined the dynamic of mankind’s development in the post-war period right up until the end of the 1980s. Who knows? Perhaps this “fourth world project” will prove to be one of long duration and will lead the world economy and humanity out of the current impasse? Andrei Volodin is Senior Researcher with the Russian Academy of Sciences’ (RAS) Institute of World Economy and International Relations.